Miriam grew up in Indianapolis and came from a relatively wealthy Jewish family. Her high school experience is described in depth in Going South: Jewish Women in the Civil Rights Movement by Debra L. Schultz. In regard to forming relationships with African American students in her school, Miriam is quoted as saying: “Jewish kids were more comfortable than a lot of the other white kids being friends with the black kids.” Miriam goes on to describe a sort of shared black and Jewish experience, in the sense that black and Jewish kids were not seen as “all-American” high schoolers like their white Christian counterparts. Discrimination towards minorities is not at all new, but what I find inspiring about Miriam is her passion for demanding better treatment, not just for Jews, but for other marginalized groups as well. In Miriam’s career as an activist, she played major roles in the Civil Rights Movement, and utilized her father’s platform as the editor of the National Jewish Post and Opinion to spread the word about the arrests and mistreatment of civil rights activists. It’s common to feel helpless in times when racial injustice, while always present, is particularly prevalent. Police brutality towards black and brown people in the United States is impossible to ignore. As a white person, I feel it is my responsibility to use my platform to elevate the voices of others, and make sure their struggles and stories are heard. Miriam’s story can help us navigate this difficult reality by teaching us that in order to achieve justice for ourselves, we must fight for the freedom of others as well. At times when Jewish people have been targeted, we have too often faced silence from those with the power to help. Therefore, as Jews, we cannot stay silent when others are targeted. We know where that leads. To me, Miriam Cohen Glickman’s story is the epitome of what it means to be a Jewish activist. As a young Jewish woman who’s passionate about racial justice in America, I believe it’s imperative that we as Jews not only look out for ourselves, but for other minorities as well. My grandmother and I attend a Black Lives Matter vigil once a month together, and this October, the vigil fell close to Sukkot. Upon arriving at the meeting place, I saw dozens of people chatting and picking out signs to hold during the vigil. Among the people in the crowd were the Rabbi that lives on my grandmother’s street and his wife. Even though I’m sure he had a lot to do leading up to Sukkot, he still made it a priority to devote his night to fighting for others. Being in this environment with other Jews feels incredibly powerful, and I know the Rabbi and I share the sentiment that we must show up for oppressed minorities. It’s not enough to fight for causes that only benefit your community. The fight for justice is universal, and I am proud that my Jewish education has taught me to embrace that ideal. Help your students understand how they can be active and engaged citizens in their communities today with our lesson, "Dr. King's Legacy and Choosing to Participate." Students can use the lens of the Civil Rights Movement and Dr. King's message to reflect on their visions for the kind of world they would like to live and discuss how two historians’ perspectives shape their understanding of personal responsibility and opportunity for enacting change. 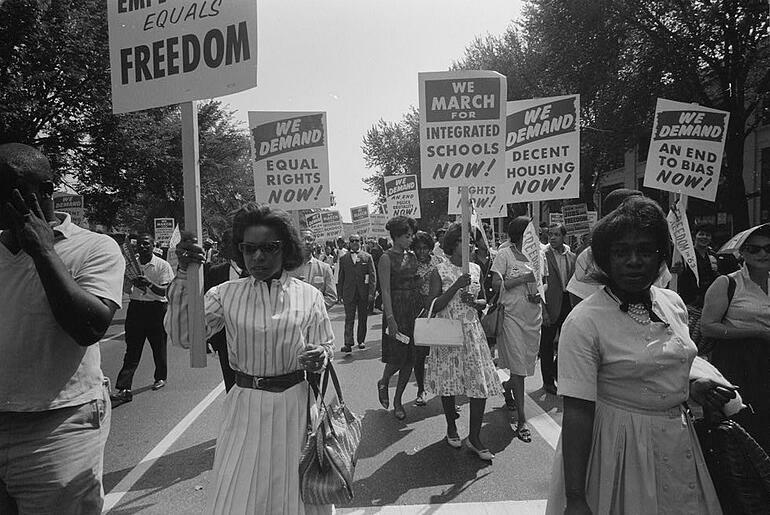 Photo Caption and Credit: A procession of African Americans carrying signs for equal rights, integrated schools, decent housing, and an end to bias. By Leffler, Warren K., photographer [Public domain], via Wikimedia Commons.